Le Tour de France is the official publication on the history of the event, written in association with Amaury Sport Organisation (ASO) by three experts. It is a celebration of one of the world's most famed annual events, which is generally considered the greatest test of endurance in the sporting world. 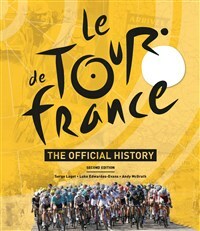 This brand new edition comprises an authoritative narrative account of each major era up to and including the 2017 Tour - when Britain's Chris Froome joined an elite club of four-time and three-in-a-row winners - with more than 300 photographs, some dating back to the nineteenth century. There are features on the superstars and memorable moments for each era. The photos include souvenir brochures, period newspapers, posters, stickers, postcards and items of correspondence, together with action shots of all the major stars both in the saddle and associated with what is universally known as Le Tour. Serge Laget has followed the Tour since 1954 when, aged seven, he watched the peloton ride through his native Cévennes region of southern France. As a journalist he has covered the race for L'Équipe - France's leading sports newspaper - for more than 30 years and also written numerous Tour-related books. Luke Edwardes-Evans has written for Cycling Weekly, Winning Bicycle Racing Illustrated, and Cycle Sport for more than 20 years, and has also edited dozens of Tour race guides. Andy McGrath, a staff writer for Cycling Weekly and Cycle Sport magazines, has covered the Tour de France, Tour of Italy, and the sport’s big one-day Classics.